You should have a structured inspection program in place for your pallet racks. That program should involve weekly visual inspections and a more robust inspection every year. But walking around isn’t an inspection. Walking around is all about observation. Dented upright posts: If a post is dented or deformed, you need to get a much closer look at it. If a forklift driver hits a rack upright, there are several bad outcomes, including dropped pallets due to beams dislodging, or complete disaster – a collapse. You should already have a program in place that encourages drivers to report any impacts. Deflected or bent load beams: For tubular racks, look for a beam that is noticeably deflected under the load. This could be the result of overloading, but could also be the result of a beam that was damaged in some other way. Whatever the cause, that beam should be checked, and potentially replaced if the deflection is outside acceptable tolerance (see your particular rack for guidance on what’s acceptable, but in general that is no more than 1/180th of the total length of the beam (or 1/2″ for an 8′, 2-pallet-wide beam). All beams deflect under loads, but the deflection should vanish when the beam is unloaded. Deformed struts or braces: Struts are the horizontal steel bars that connect two upright posts. Braces are the diagonal steel that connect two struts. If either component is bent, it’s an indication of issues with loading, impacts or capacity. Are beam connectors or bolts dislodged? Are your snap-on safety clips engaged? For structural racks, are any bolts missing? If so, fix those and get a closer look at the rack to be sure nothing else has happened that caused the disconnection. If it is ongoing, that indicates a rack specification or loading issue you need to address. Are the footplates damaged? If there is concrete dust, bending, or missing bolts, the base plates should be checked. Replace the frame if they are sheared or if welds are cracked. They can be compromised by seismic activity, impacts pulling up on them or foundation settling. Check the anchors: To achieve correct capacity ratings and better safety, pallet racks should be anchored. If there are any missing or damaged anchors, they should be replaced. Rusted or scraped components: An upright with scraped paint or rust can also be compromised and weakened. Are there damaged welds? If a beam has been struck, it may stay seated in the teardrop connectors while the welds are compromised. Look for cracks and obvious damage. If you see it, address the issue as soon as you can. Look for opportunities to avoid issues: All posts in forklift aisles should be protected with upright frame protectors or guard rails. Loading factors represent both safety and functional problems. If people aren’t accurately loading pallets, they can easily tip a rack while loading. If they mis-load it , they could cause undue stress on the rack because the load is too heavy, out of center or unbalanced. Is the rack plumb and straight? If the rack is out of square in any manner, it’s at risk. It may also indicate an unreported forklift impact. In any case, it should be addressed immediately. Damaged pallets: Inferior pallets are a problem for many warehouses. With the wrong load at the wrong time, a bad pallet could break and spill its load. Or potentially trigger something worse, like a person being struck. Inappropriate pallets: Your rack system should be specified for the pallets it will host. Changing the type or size of pallet can alter capacities or the rack’s ability to correctly hold them. The right pallet type isn’t easily dislodged, so nonstandard pallets may be an issue. Don’t use pallets that are too large, or too small for the rack. 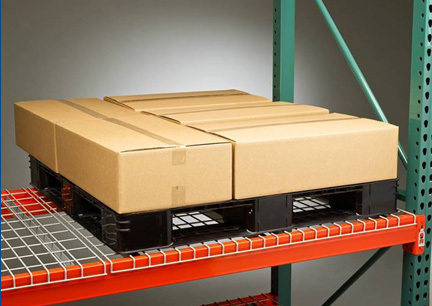 Small pallets could drop, while larger pallets could overlap, cause loading/unloading errors, or push through to flue space and into the row behind them for double row racks. Don’t put skids in racking without timber decks since they can also drop through the beams. Post pallets may not key correctly into your rack, and need to be tested prior to being loaded. Aisle clutter: Aisle clutter gets in forklift drivers’ way and causes all kinds of issues. Drivers who are forced to drive around things like stacks of pallets or trash are more likely to hit racks as they maneuver. They’re also more likely to strike a worker on foot. Has anything been altered or replaced? If a rack component has changed, you need to know. You need to understand what was taken out, what was added, and if it was the right component with the correct capacities. Are capacity signs posted? Racks have specific capacities, which should be posted and enforced. It is inexpensive and easy to produce capacity signage for your racks. Is the load spacing correct? If you’re loading pallets into the system with too little vertical space between top-of-load and the bottom of the next beam level, you’re asking for issues. Make sure the load profile allows for correct vertical spacing. You can see at a glance when it’s less than 6″ total. Is there adequate horizontal space between the pallets? Has the flue space been compromised? (See: how to maintain flue space). Does the rack have row spacers? Row spacers are critical for providing adequate space between two rack rows, to prevent pallets on one side from impacting pallets on the other rack row and to maintain plumb lines. Be certain your rack has spacers installed. Frames up to 10′ tall should have two spacers each. Taller than that should have three. Are they moving too fast? Are they having trouble loading high bays? Are certain areas and loads more problematic than others? What’s inefficient about the process that you can improve? Are there safety issues with falling items? Can you see where cartons have been pushed around or are otherwise unbalanced in the rack? Are workers accessing upper levels for carton or each picks in an efficient, safe manner? Are there too many risky interactions with forklifts? Part of a good walk is good conversation. You should stop and talk with people as you observe them at work. Find out what bothers them; what they think the issues are. You’ll get great information from the best source: people with first hand knowledge. All of these things and plenty more can be discovered in casual, but focused observation. These types of quick warehouse walk-throughs are not time consuming, and may help you avert a real issue or create true value by making needed changes. You should walk not with the day’s business on your mind, but with an outsider’s critical eye. You’re likely to find issues that allow you to make significant operational improvement.